When Bucket Brigade says they have a new musical, they mean new. 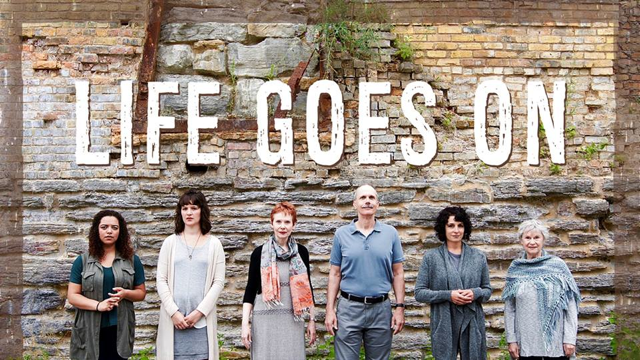 Life Goes On, their current musical offering, is only six months old. And for a toddler, Life Goes On has an awful lot of wisdom and entertainment value to offer. 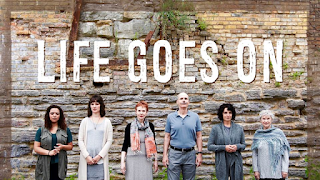 The story of Life Goes On centers around Stacia (Vanessa Gamble), a trauma surgeon still struggling with the death of her father (Bob Beverage). The one year anniversary of this loss is approaching, and though Stacia has buried herself in work, it isn’t helping. So she takes a break to go home and visit her Mom (Janet Hanson) and estranged sister (Katie Consamus). In addition to being distant from her mother and her sister, Stacia has also avoided meeting her new grandmother. Dad discovered the birth mother who had given him up for adoption and managed to establish a relationship with her shortly before his death. That woman, Anya (Dee Noah), is in a nearby assisted living facility. So Stacia has a lot of catching up to do, for which her sister, and Anya, and even the nurse-in-training who works at the assisted living facility, Sage (Falicia Cunningham), aren’t cutting her any slack. Everybody is hanging on by a very thin thread here. The loss and emotions surrounding it are still pretty raw. Good memories of Dad help a little, but everyone is fumbling around, trying to find a way to build a life without him. The great thing this conceit does is set up a story centered on an ensemble of five very impressive women, brought to life by equally impressive performers. The voices here are first-rate, and when the women sing in any combination, from two all the way up to five, it’s gorgeous. (No disrespect intended to Dad, he gets his moments, too - but this show is dominated by the ladies.) The music here gives them a lot to work with, too. The songs are varied and compelling with some really lovely melodies throughout. Bucket Brigade Artistic Directors Jeremiah and Vanessa Gamble have crafted an engaging story here (book and lyrics by Jeremiah, music by Vanessa and Jeremiah), repurposing recent events in their own lives into something more universal that most audience members can recognize and empathize with. Director Jeffrey S. Miller and Music Director/Arranger Michael Pearce Donley have gotten both good dramatic and musical performances from a talented ensemble. Katie Phillips’ scene design and Courtney Schmitz’s lighting design, backed up by Nate Farley’s work on props, take a simple design concept and allow Life Goes On to tell a story with a lot more characters and locations than you might expect. Six chairs, a table, and two trunks full of props and costume pieces, all allow the actors to take on multiple roles and move swiftly from one scene to the next. A nod should also be given to Miller as director, Pearce Donley as music director, Kelli Foster-Warder as choreographer, and Sarah Pierucki as stage manager for keeping everything moving so seamlessly along. People with less vision would have marked the beginning and ending of every scene and song with a hard stop and start. Letting it flow is the way to keep a complex story about a hard subject from bogging down. The whole production has a very light touch for something so potentially emotionally fraught. Right now, Life Goes On clocks in at just a little over 90 minutes. One wonders what they could do with an extra half hour and an intermission. The story and all the characters still work as is, but sometimes it can feel a little rushed. And even though it’s structured at first as if it’s Stacia’s story, the focus broadens out to the other characters and it starts to feel like the script really wants to spend more time with those people. This is particularly true of Sage the nurse-in-training, and I think this can partially be credited to Cunningham doing a lot with the little material she’s given. Right from her lines in the opening musical number, you think “Wow, she’s got a heck of a story to tell.” And her big solo number reinforces this. But that’s it. We don’t get any more about her personally. This, and other questions the play raises don’t feel like mistakes so much as they feel like missed opportunities, unexplored avenues. Stacia doesn’t appear to have a personal life at all. What’s that about? Sis reveals that she’s separated from her husband. Why? Was it the grief over her father’s death and the need to support her mother when Stacia checked out that put a strain on the relationship or was it something else? Also, she’s a stay-at-home mom who homeschools the kids - how’s that going to continue to work with her estranged, possibly ex-husband? Mom references money issues, and is going through the house to downsize her possessions and move. All of that’s huge, plus Stacia’s going to establish a scholarship for women going into medicine, in part to help support Sage. Maybe Stacia should be applying those buckets of money she’s making to help support her mother or sister instead? Or they should at least have a conversation about it? Honestly, how did Mom get through the year and not wind up a basket case like Stacia? In fact, the only character who seems to have just about the right amount of stage time is Anya. Sure, I’m curious about those 17 brothers and sisters (how many of them actually lived to adulthood for starters). I’m also curious about the man who got her pregnant, lo those many years ago, and how the rest of the new family she’s acquired feel about the idea of him. How did she get to America? How did Dad find her? Sure, those are all questions, but they feel like normal questions, not stuff left on the table that would impact the current story that much. Her big “Family” song almost feels like filler for a minute, until you get to that last verse and realize the happy set-up was all so they could gut-punch you with something you allowed yourself to forget for a second. Because the structure feels so tilted toward Stacia at the moment, and the other characters are not as fully realized, the little snippets of “here’s how my life turned out” for the whole cast as they jump forward a little in time at the end really feels like stuff I don’t need right now. There’s a powerhouse song before that which really feels like the end of the show that I just jotted down a note and called the Naming Song. It’s actually an outgrowth of an earlier song being reprised, where the characters at the retirement home gather their chairs in a semi-circle and share stories from their lives, to jog their memories and remember. At the end of the show, the song returns and then transitions into a powerful moment where they start overlapping, singing the names of people important in their lives. The music swells, and it often sounds like bells are ringing, and the naming continues. And you start to realize, they must be naming people now that the actors know, that the writers know, the crew, the musicians, the box office, the ushers. Maybe they’re throwing out random names, figuring someone in the audience must know a person by that name who they’ve lost. That’s your closing number as far as I’m concerned. It’s hard to top the emotional wallop of that song.